Durable 99.1% pure iron wok with sturdy riveted handle tube using solid iron rivets. 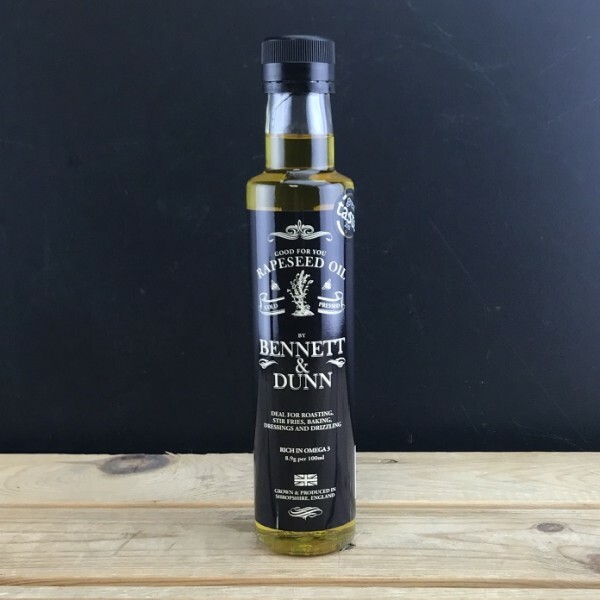 Hand made, British oak handle with brass fixing. Unlike our frying pans, we spin this iron wok to a thickness of only 1mm. 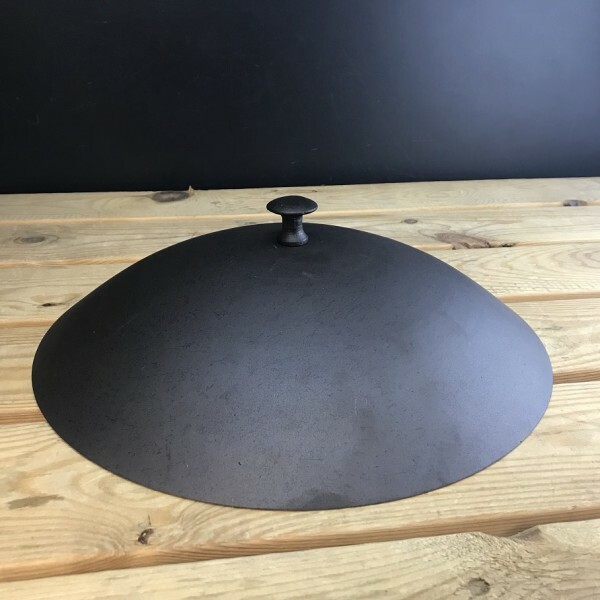 We do this to ensure that the wok heats up quickly when placed on the hob and cools down fast when the heat is removed, an essential requirement for stir-fry cooking. 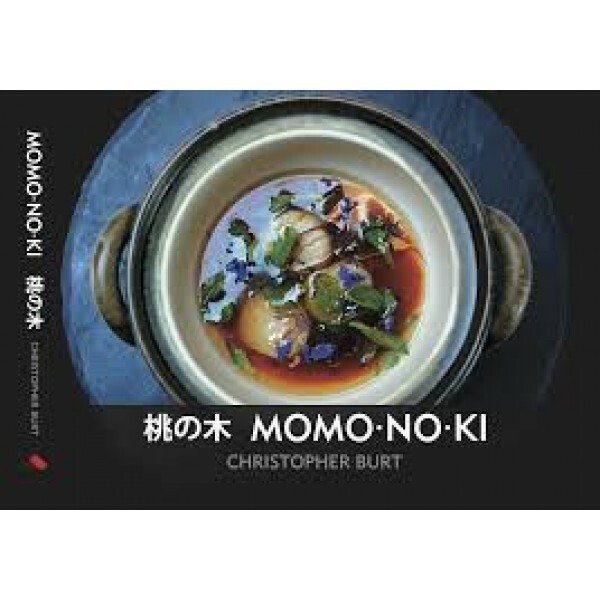 This wok is light and easy to handle. Weight 0.76 kg, 10'' (27cm) rim diameter, 5" (12.5cm) base diameter, 3'' (7cm) pan height, 7" (17cm) handle. I've lost count of the number of woks I've gone through in the past few years. 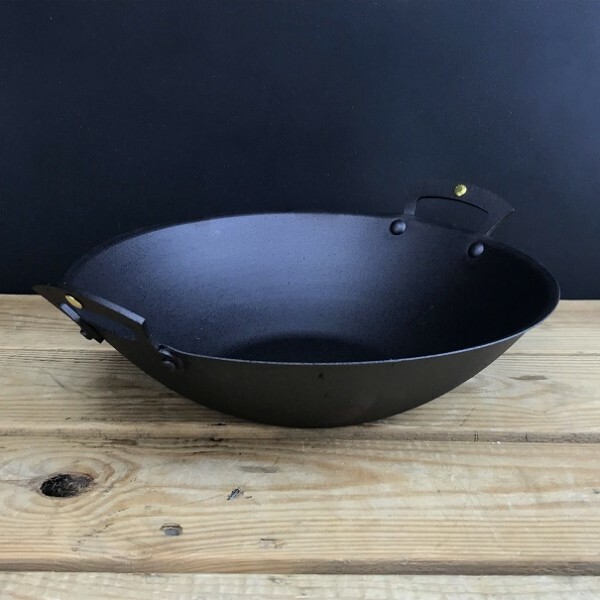 The last one I had was a posh 'green' non-stick one which was ruined within 6 months - what's the point of a wok that you are instructed not to use at high heats?! 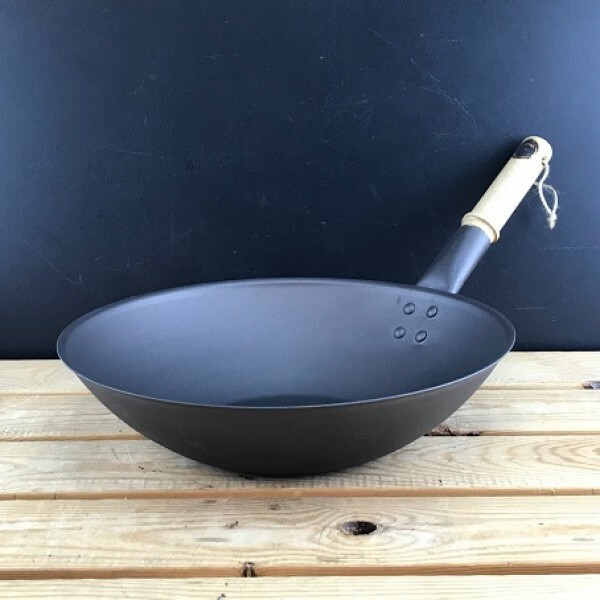 I remembered an old cast iron frying pan I has years ago which built up an amazing patina so decided to go cast iron again, although I did buy if directly from the manufacturers as they were able to answer my questions about how heavy the wok is (to pick up) and how thick the iron is. Anyway, as the previous review details, the design is really terrific. The wok isn't too heavy and is just right for stir fries or whatever you want to make. My wok is starting to build up a lovely non stick patina and I know it will only get better and better the more I use it. I expect it will last as long as I do! 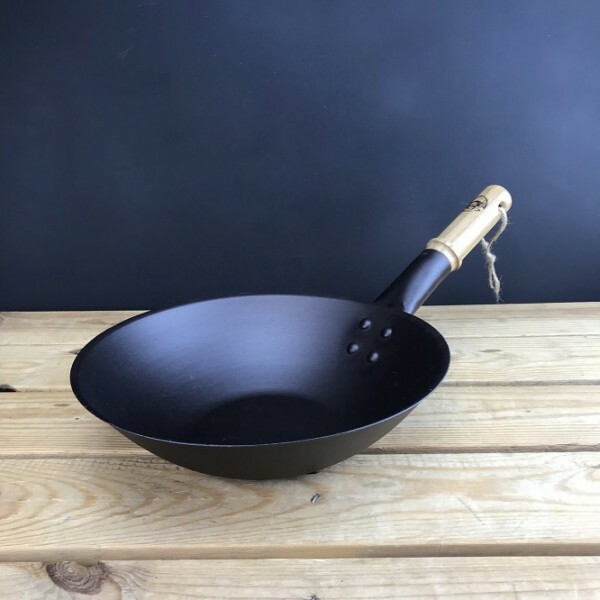 So don't waste your money on non-stick or cheap steel woks, invest in this lovely British-made number and have a wok for life! 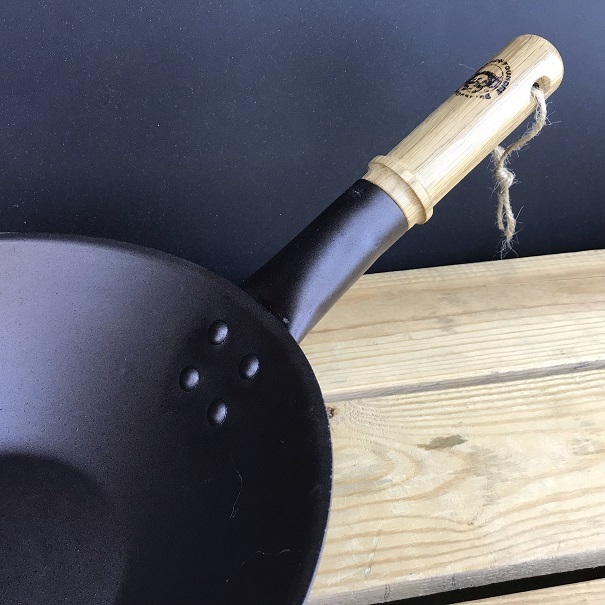 Why choose a pre- seasoned wok ? No chemicals or PTFE are used in the coating of the wok. Why use an Iron wok? Iron woks are tough and can be used at very high temperatures. 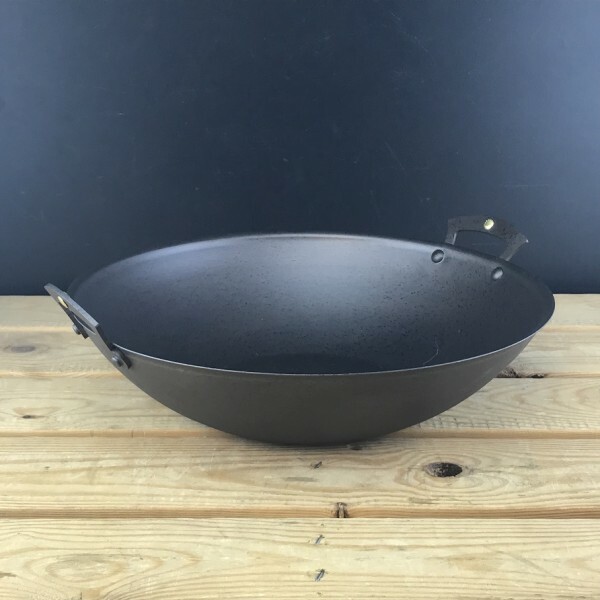 This iron wok is suitable for all types of hobs and grills. 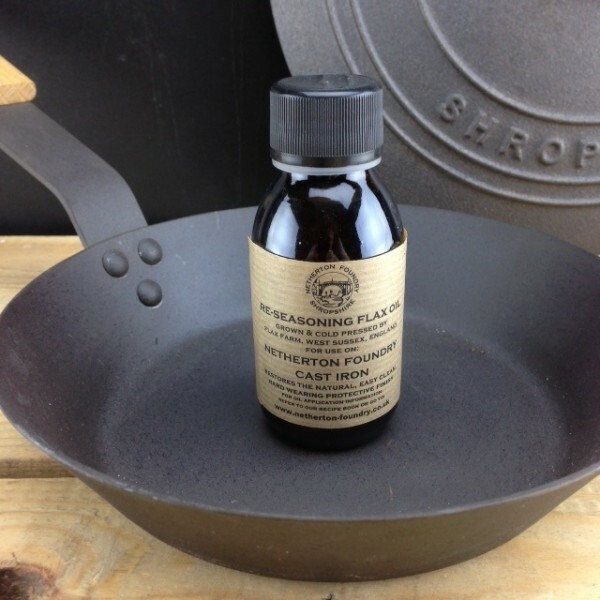 What’s special about OUR spun black iron pans? Serious cooks and professional chefs love the way that black iron pans heat evenly and give great cooking performance. The more you use your pan the better it gets as the seasoned patina develops. Be patient; allow the food to cook before trying to turn it over. Don't fry food straight from the fridge, allow it to come up to room temperature. The pan bodies are spun by hand, so each one is slightly different. They will not all be as flat as a billiard table. If you do want to keep it as flat as you can, then follow these simple guidelines. Every time you use the pan, heat it SLOWLY to frying temperature, then you can use full power. This is especially important if you are using powerful cooking hobs such as induction. Use a hob the same size as the pan base, small rings WILL warp big pans. Never drop a hot pan into cold water. This will buckle it. 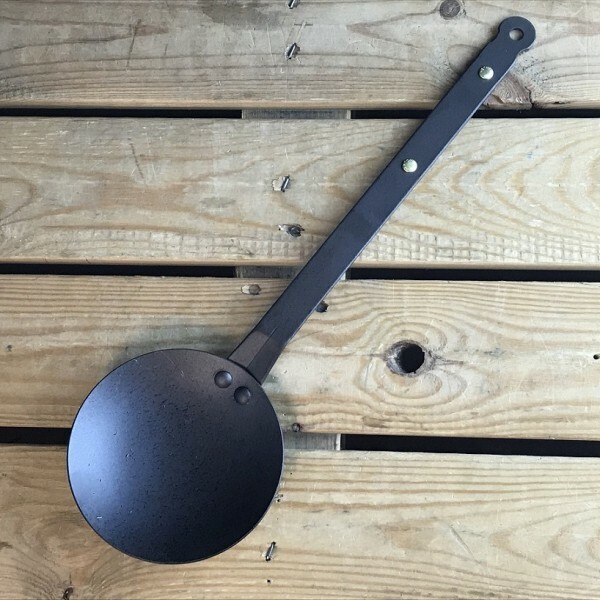 If your pan has oak handles, the grain on every piece is unique and each one is branded by hand. They are like fingerprints, no two are identical. Love your pan and follow our instructions for re-seasoning. Oven seasoning is kinder to the pan than hob top seasoning and it also give a nicer looking finish. 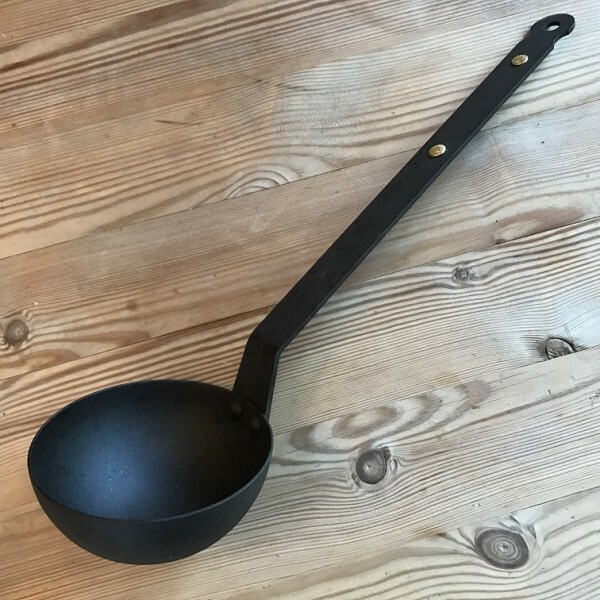 We suggest that you only use hob top seasoning, if your oven is too small for your pan or you are re-seasoning your wok. Your pan will develop with use and, if cared for, will age beautifully and be a friend for life.